The Moriarty Chalice is a grim reminder of a dark chapter in Kerry’s history. It was presented to the Tralee Dominicans in 1651, at the height of the Cromwellian conquest of Ireland. It was a very bleak and dangerous time for Catholics, who – to the Cromwellians – were heretics. Catholic clergy were expelled from the country and those who went into hiding risked execution if found. Mass could only be held at secret locations. In 1653 the Prior of the Tralee Dominicans, Thaddeus Moriarty, was captured, tortured and murdered by Cromwell’s troops. 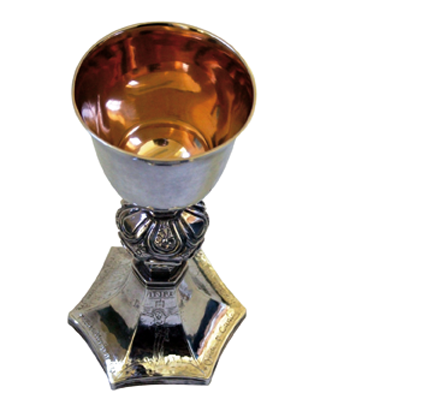 The chalice was thought lost but astonishingly found its way back to Tralee 200 years later. KCM have it on loan from the Dominicans who still use it for special masses to this day.